This week, Apple introduced a tablet computer. I have been skeptical that a tablet would even be released. Who needs one? What would it be used for? I couldn’t think of any good answers. Even as far as two-thrids of the way through the announcement of the actual iPad this week, I remained completely nonplussed. Then it hit me… this is not made for people like me. This is purpose built for our parents, our grandparents, or our kids. It is the computer for people who don’t need a computer. Which leads me to the snapshot above. 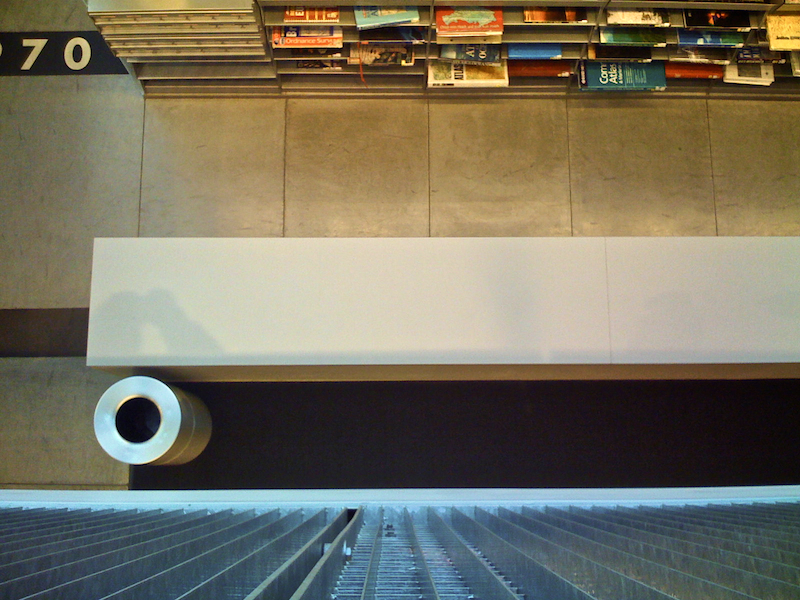 A funky angle taken looking over the railing in the Seattle Public Library. Rows and rows of books waiting to be held, browsed, and read. And while I am not stupid enough to predict that tablet computing will end the print industry; looking down at all these beautiful and dusty old books, I do know one thing… this will become a rare museum soon enough. And as technologically forward as I consider myself… that thought just makes me feel nostalgic and old.